Gemini September 2016 Horoscope predicts that planetary strength is located in the lower half of the horoscope towards the nadir sign in September 2016. The House of home is powerful and your career planet is weak. The focus should be on domestic matters and professional issues will not be important this month. This month can be auspicious for buying and selling of a new house or for major maintenance of the existing accommodation. 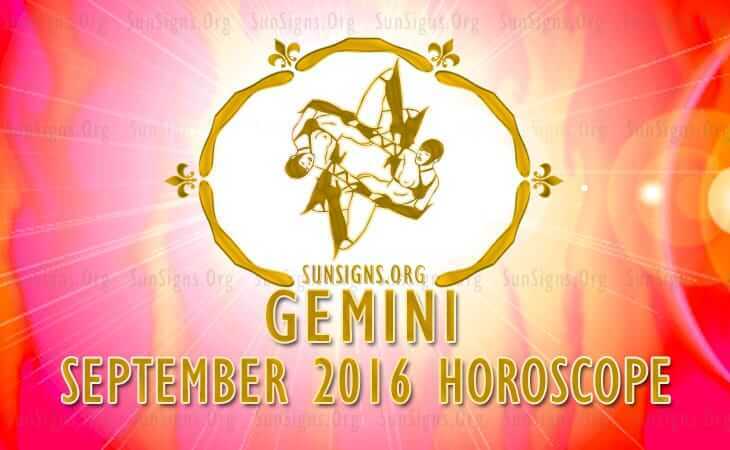 September 2016 will bring about significant changes in the Gemini love life as well as health condition. Your intelligence and communication faculties will see radical improvement. Students will do well in their educational career. The Twins will be strongly impacted by the two eclipses this month. The Lunar eclipse will bring vital changes in your finances and career. Your awareness about life and religious beliefs will get altered significantly. Conflicts with senior members of family are indicated. The Solar Eclipse in September 2016 will be responsible for important transformations in the family environment of the Gemini born. All the shortcomings of your family will become clearer and you will get a chance to make necessary corrections. Emotionally there will be plenty of turbulence. Lives of children will undergo major alterations and parent children relationship will be under strain. The September 2016 monthly astrology predictions for the Geminis says that your career will be subject to radical change. Not only your personal status, but also the status of the corporation for which you work will be under threat. Your career changes or business decisions will affect your family relationships. Gemini, you will be more interested in having fun and your interest in earning money will be secondary. The second half of September 2016 is favorable for making money. Money and wealth may come from new opportunities or from unexpected sources. Monetary problems will get resolved by end of the month. The Cancer 2016 zodiac forecasts suggest that there will be plenty of romance in your love life with your spouse or partner. Relationships are governed by feelings and not by cold logic. You will be more forceful in making new relationships. Singles will have equally passionate and sexually enticing relationships. Towards the end of September 2016 your social activities will increase and your life will be full of enjoyment. Current love affairs for the Cancerians may be under the weather and weak ones may fall aside. You might even think of planning for a baby. The Cancer Health is a matter of concern till the third week of September 2016. You should focus on your emotional fitness more this month. And do not neglect your mental health. You need to open your 7 chakras if you want your mind, body and soul to be in alignment. The September 2016 horoscope for the Gemini zodiac sign foretells a month that is full of domestic bliss.